NISS is a national institute of modest size that delivers high-impact research in science and in public policy by leveraging the rich expertise of its staff with that of its base of affiliated organizations in academia, industry and government. As its name indicates, NISS works on issues where information and quantitative analysis are keys to solutions and decisions. NISS functions in three ways: as expert advisor, as basic researcher, as collaborator. NISS serves as a neutral, objective expert or as an advisor to evaluate policy, to review organizations, to define the technical context for complex problems in government and in industry. 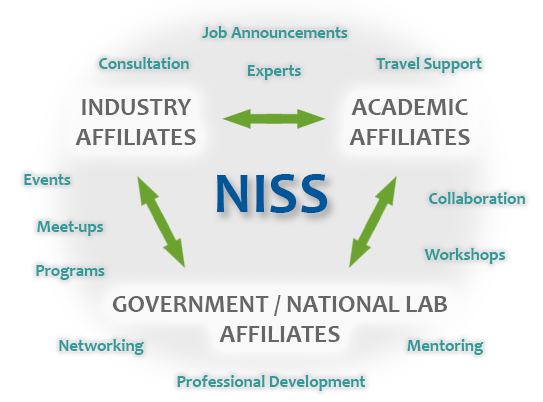 NISS also serves as an independent research organization, assembling state-of-the-art information and developing theory and methodology to solve problems of import to science or to policy. NISS also acts as a convener, collaborator and hub for complex projects that require expertise from multiple sources whether these are drawn from academia, government, or private corporations. The hallmark of a NISS project is the high level of expertise brought to bear that then leads to relevant and useful solutions or recommendations for decisions that are ready for implementation. NISS is structured to achieve high-quality results because it pairs experienced senior leadership with teams of talented (post-PhD) junior researchers and technical staff. Senior leaders come from NISS staff and are also recruited for the duration of a project from faculty or other senior researchers with skills specifically matched to that project. NISS can be agile in selecting projects because NISS Directors remain current with the frontiers of statistical sciences and quantitative analytic methodology. NISS can be responsive to new issues because of its flexibility to expand the base of expertise to meet the specific requirements of each project. NISS is capable of solving highly complex problems because it can also draw on the NISS Family of Affiliated Organizations currently numbering 40 academic institutions, 8 government agencies and 12 corporations. NISS brings expertise to clients and collaborators who need state-of-the-art statistical thinking. NISS evaluates the critical issues, assembles the relevant statistical methodology, emphasizing the most recent advances, with the goals of understanding and articulating complex problems to lay the foundations and designing the strategies for solving them. NISS convenes team of experts to provide neutral third-party evaluation for issues of policy and for program evaluation. Prior to making their recommendation these expert panels consider the technical aspects involved in accurately interpreting data beginning from initial plans for gathering of data through data editing and analysis to drawing inferences. NISS maintains a steady stream of statistical research and methodological innovation. Problems may be posed externally as when national tests of education progress returned scores to individual public schools that could not be directly compared to state or national averages because of the important differences in student populations. NISS developed the template for calculating fair and unbiased comparisons. When a predictive analysis of putative biomarkers needed to draw on all the different kinds of information in multiple data sources, NISS developed the analysis and also probed the limits of prediction possible from the heterogeneous and only partially overlapping data. The failure of biomarker studies to replicate led to a National Cancer Institute-sponsored multi-institutional effort and a series of large scale studies to extend calibration methodology to the entire process from specimen preparation through data interpretation. NISS also conducts funded research on problems as diverse as development of methodology for combined analysis from multiple private and secure data contributors, OR new methods for ­the analysis of cardiac rhythms and identification of aberrations. NISS has collaborated on big problems since its inception. Large, complex problems demand a wide array of expertise and NISS assembles teams to tackle these challenges. Whether the challenge is to develop an effective model for syndromic surveillance for an early warning system for epidemics, OR to understand how the cognitive process differs when students learn online compared to reading from print text, the research relies on innovation in statistics and on deep knowledge of the scientific underpinnings. Only a well-chosen team can succeed. NISS also partners with academia, industry or government, sharing research resources and jointly supervising junior researchers. NISS postdoctoral fellows may have both technical mentors from NISS and practical mentors in a substantive field who work together to ensure that the scientific problem is faithfully solved while the postdoctoral fellow gains in technical research experience and in ability to collaborate effectively. NISS hosts conferences and workshops for the statistical science community. As part of the Affiliates Program, NISS annually focuses conferences on topics chosen by the Affiliates Committee, always including at least one of specific interest to Government Affiliates. In addition, Explorations Workshops are small “think tank” working sessions designed for problem-holders in a science or public policy community to bring to select experienced statistics researchers their pressing issues and hard problems. The goal of these workshops is to articulate the needs of the community and to explore potential technical statistical avenues for solution. NISS also sponsors series of workshops like ITSEW, which it co-founded to meet international needs for survey methodology to deal with total survey error.